Tonight we made a belated Father’s Day dinner. I had wanted to finish it off with a cherry pie ironically I’ve been too overwhelmed with cherries to accomplish it! 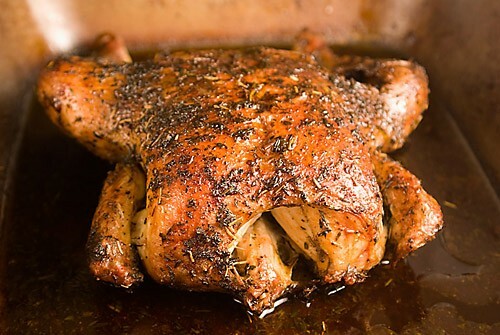 Look at this gorgeous roast chicken from HonestCooking.com see how it looks flat? That is a juicy tender chicken right there. I bet it falls right to pieces. Check out the stellar instructions over on their blog. Our roasted chicken cost $16 at the market this weekend. I cooked it in a roaster with about 1/4cup of water in the bottom and sprinkled a few herbs on top. Lid on and in the oven at lunch time at 200C makes for a juicy tender chicken by dinner and the house doesn’t get hot because the oven is on low. I sliced several beets and steamed them briefly while I chopped carrots and garlic scapes for a salad and made a simple wild rice risotto to go along with it. I sautéed shallots and scapes with some butter then added two different kinds of rice. My wild rice comes from Naosap Harvest in Manitoba, did you know we grow rice here in Canada? Pretty neat huh? The brown rice comes from my organic buying co-op. We go through roughly 25lbs or rice per year. 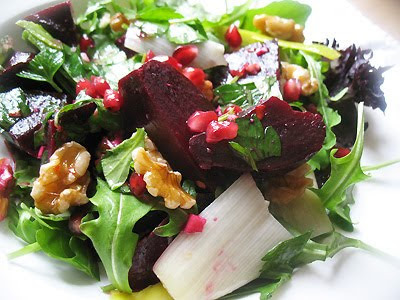 Check out this tasty looking salad from Lisa’s Kitchen. She has a fancy beet salad recipe over on her blog.